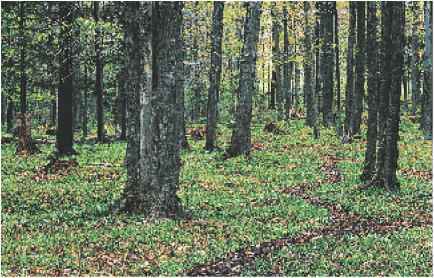 Figure 15 Many examples of symbiotic relationships exist in nature. Lichens are a result of mutualism. Clown fish and sea anemones have a commensal relationship. 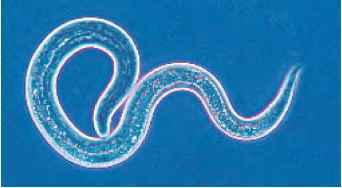 Some roundworms are parasites that rob nutrients from their hosts. Not all relationships among organisms involve food. Many organisms live together and share resources in other ways. Any close relationship between species is called symbiosis. Mutualism You may have noticed crusty lichens growing on fences, trees, or rocks. 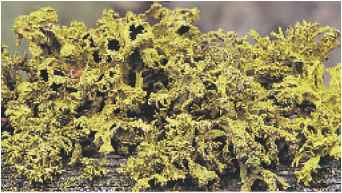 Lichens, like those shown in Figure 15, are made up of an alga or a cyanobacterium that lives within the tissues of a fungus. Through photosynthesis, the cyanobac-terium or alga supplies energy to itself and the fungus. The fungus provides a protected space in which the cyanobacterium or alga can live. Both organisms benefit from this association. A symbiotic relationship in which both species benefit is called mutualism (MYEW chuh wuh lih zum). Commensal ism If you've ever visited a marine aquarium, you might have seen the ocean organisms shown in Figure 15. The creature with gently waving, tubelike tentacles is a sea anemone. The tentacles contain a mild poison. Anemones use their tentacles to capture shrimp, fish, and other small animals to eat. The striped clown fish can swim among the tentacles without being harmed. The anemone's tentacles protect the clown fish from predators. 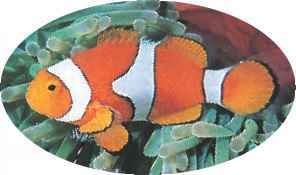 In this relationship, the clown fish benefits but the sea anemone is not helped or hurt. A symbiotic relationship in which one organism benefits and the other is not affected is called commensalism (kuh MEN suh lih zum). Parasitism Pet cats or dogs sometimes have to be treated for worms. Roundworms, like the one shown in Figure 15, are common in puppies. This roundworm attaches itself to the inside of the puppy's intestine and feeds on nutrients in the puppy's blood. The puppy may have abdominal pain, bloating, and diarrhea. If the infection is severe, the puppy might die. A symbiotic relationship in which one organism benefits but the other is harmed is called parasitism (PER uh suh tih zum).